It's your mother's birthday so only the best will do! With that in mind, we present to you this splendid greeting card that your mother will fall in love with! It has a beautiful fancy look that will capture your mother's attention and make her appreciate that you cared to send the very best. This birthday card showcases gorgeous pastel colors, pretty balloons, flowers, and an elegant cupcake with a lit candle! Your mother is really going to enjoy this birthday card! Happy Birthday To My Sweet Mother! 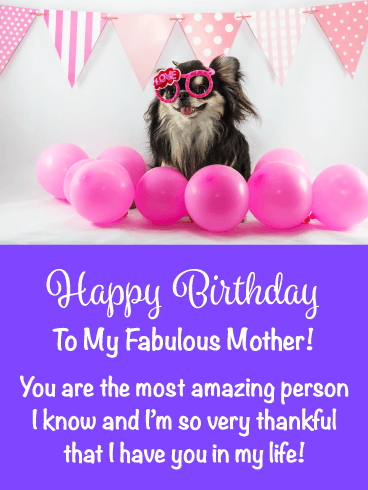 Turn your mom's birthday into a fantastic event with this birthday card! Fill the day with excitement and let the light of your love for her guide the day and years ahead. She’s a spectacular woman and you would be thrilled if you had a fraction of her strength. Make sure her day is the best it can be and send her the perfect start to an amazing birthday! Gift your mom an outstanding birthday! Make her heart burst with joy at this heart-shaped firework. A symbol of how bright and all-encompassing your mother's presence is, this explosion of color is the perfect representation of how important your mother is to you. And how shimming and bright you wish her birthday to be! 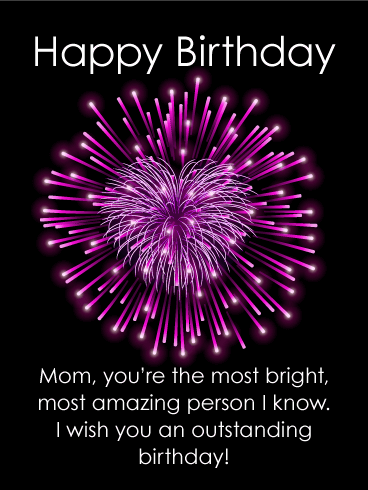 Send your mom this birthday card and know she'll have an amazing day. Mother's are special and deserve nothing but the best on their big day. That's why this strawberry cupcake birthday card will be perfect for her! It showcases a lovely flower cupcake with sprinkles against a beautiful background. Your mother will be thrilled to receive such a delightful birthday card from her child. 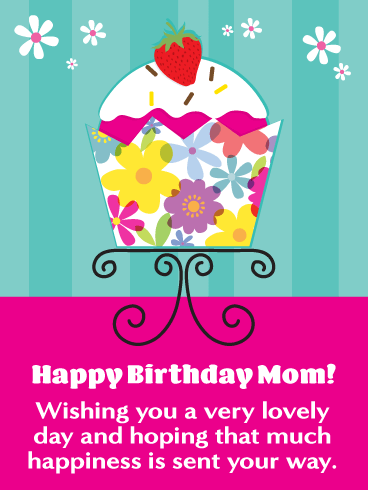 So wish your mother all the happiness that she deserves with this fantastic cupcake greeting card! 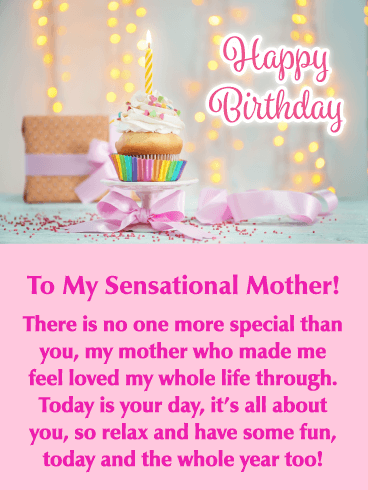 Send this touching birthday card to your mother this year, it will make her big day a memorable one! 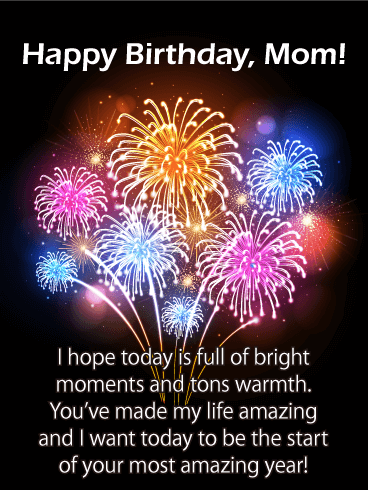 The word MOM is displayed beautifully and will catch her attention the moment she sees this outstanding birthday card. The loving note will bring a tear of joy to her eyes as she reads how much you appreciate all that she has done for you over the years. A birthday card such as this will truly make your mother's day! This darling birthday card features pretty flowers, a lovely bird, along with cute ladybugs and a little bee. These elements were gathered together to create a greeting card that any mother would adore! The great combination of colors makes it even more special, she is going to really enjoy it. It displays endearing words that express how much you really do love your mother. 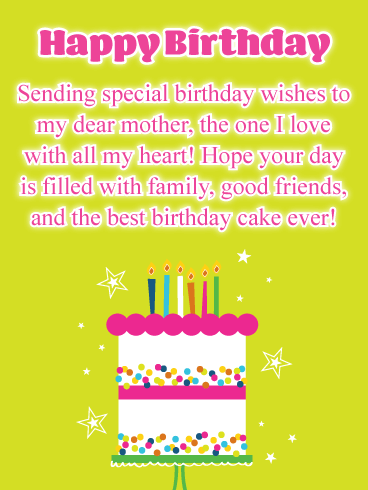 Send this charming birthday card today! A birthday is a time to celebrate, especially if it's your mother's birthday! This calls for an exciting greeting card, one that is bursting with colors and glittering lights. This exceptional birthday card is a popular choice for those wanting to send the very best to their mother on her big day! 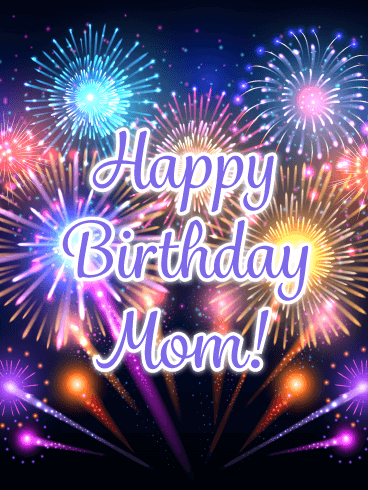 A grand occasion like this deserves an outstanding birthday card, so send these sparkling fireworks over to your mother today! 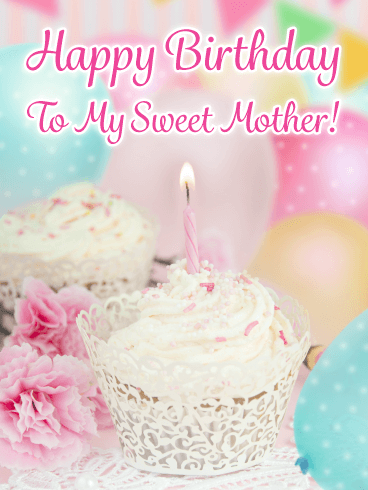 If you are looking for a stunning birthday card to wow your mother, you just found it! This impressive greeting card has it all - golden glittering lights, a fancy cupcake with sprinkles, a lit birthday candle, and a thoughtful loving message written just for her. She will appreciate the fact that you feel there is no one more special than her. Send this spectacular birthday card her way now! No one can resist a cute puppy, especially when it's wearing pink sunglasses. So sweet! 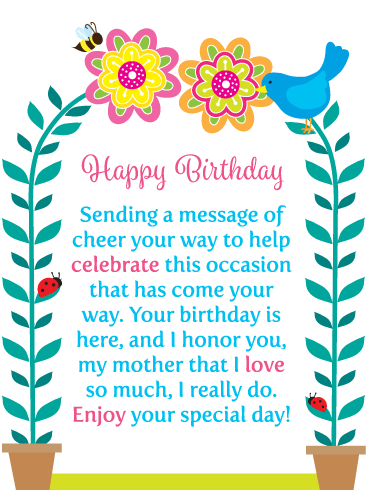 This adorable birthday card is going to brighten your mother's special day! The pink birthday balloons and decorative steamers look very festive and the loving words give it a nice personal touch. Send this little puppy off to your mother today so the celebration can get started right away! Birthday balloons can make anyone's day special! 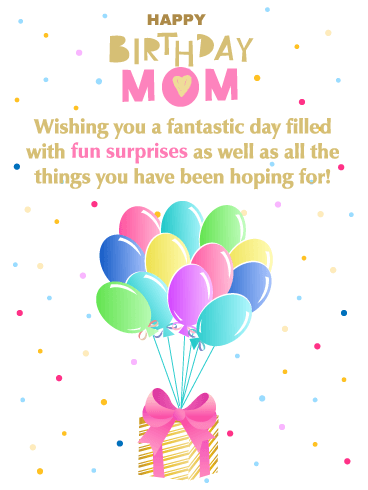 So what are you waiting for, get this birthday card that contains wonderfully decorated balloons over to your mother today! She is going to just love it! Along with the awesome party balloons, this birthday card sports a message that will make her feel great on her big day. It expresses that you think she is an inspiration and that she is the best! This will certainly make her birthday a sensational one! Birthday cakes are a popular birthday icon that can make any birthday complete! That's why this special birthday card was designed with a spectacular cake that features pink frosting, sprinkles, and of course, lit birthday candles. Along with the colorful creative design, this birthday card contains words of endearment that will touch your mother's heart. Be sure to send this fabulous cake to your mother soon while the candles are still lit! Brighten your mother's day with this pretty birthday card of pink and blue, it will bring a smile to her face and joy to her heart. The eye-catching design brings together wonderful colors, great shapes, and a lovely pattern of polka dots that give this birthday card an impressive look! The meaningful message lets your mother know you are sending love and cheer her way, this will surely make her birthday extra special! 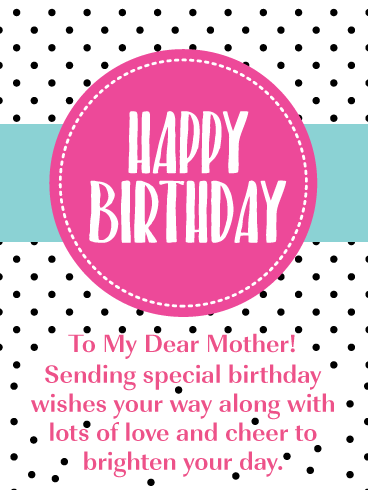 Dazzle your mother on her birthday with this beautiful greeting card! It showcases a golden gift box tied together with a lovely pink bow being carried by a bouquet of colorful balloons! It's surrounded by confetti giving it a wonderful element of celebration! The message wishes your mother a day filled with fun surprises along with everything she's hoping for. The birthday card was creatively designed to give it that personal touch so that it will make your mother feel special on her birthday!